The final of the Nottingham Restaurant & Bar Awards’ (NR&BA) Best Young Talent, Front of House Award, took place at Nottingham College’s Adams Restaurant last month (21st November), with Chris Stamp (Adams Restaurant Commercial Lead/ Hospitality Lecturer) as one of the guest judges. Now in its second year, the NR&BA are a celebration of the superb food and drink industry the city and the county has to offer. The award is designed to encourage and inspire people within Nottingham's hospitality industry and to profile front-of-house as a well-respected profession. 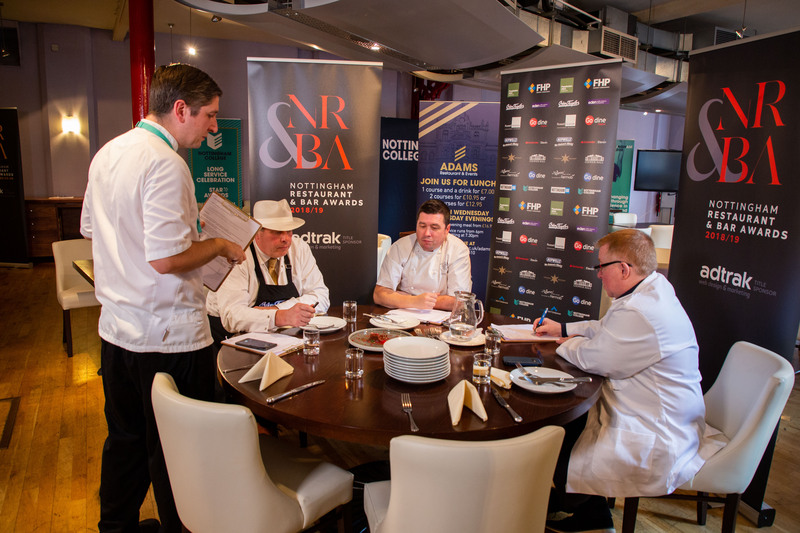 Phil Tomlinson (Faculty Area Manager – Catering and Hospitality) and Jim Tippett (Adams Restaurant Chef) were on the panel of judges last month for the final heat of the Best Young Talent ‘Back of House’ category, which the College also sponsored. Three finalists made it through to the cook-off, which took place this week (Monday 3rd December) in our Adams Restaurant. These were: George Mcmillan from The Farndon Boathouse, Jack Pierce from World Service, and Harry Woodford from Perkins Bar Bistro. The winners will be announced at a special black-tie awards ceremony held at Colwick Hall Hotel on 31st January.